Let’s take the video first. Like “Night and Day” itself, the clip is fantastically ambitious, technically precise, mostly entertaining, and yet still a bit frustrating in its arch impenetrability. 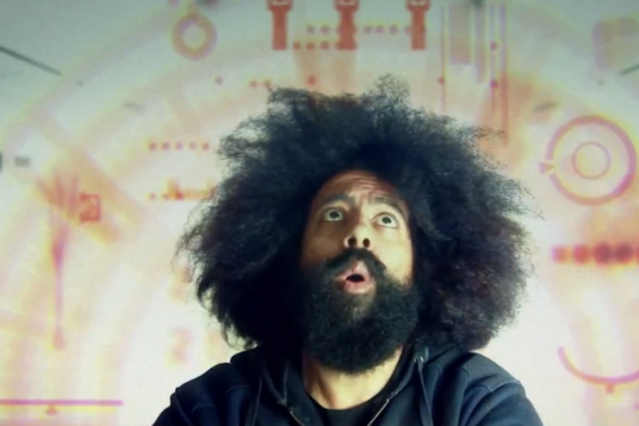 Directed by English actor-comedian Peter Serafinowicz, who also oversaw the video for One Life Stand’s “I Feel Better,” these visuals brim with enough lively ideas — Reggie Watts, egg-worshipping monks, Flight of the Navigator-style spaceships — to match the song’s wobbly synths, urgent pulse, and limber hook. As with the song’s standout “Zapp not Zappa” moment, however, the video ultimately feels slightly like it’s talking past us — although villain-guy (Oscar-nominated English actor Terence Stamp) lip-syncing to the band’s words “Do I look like a rapper?” is a fun touch, and the whole thing is definitely worth watching if you’re at all a fan. New songs! As previewed on Jools Holland, In Our Heads’ “How Do You Do” returns to the mature-love themes of One Life Stand, with its own metaphysical twist: “How do you do it / You make me want to live again,” goes the chorus, over this lithely funky, uptempo cut. “Don’t Deny Your Heart” is equally dance-friendly, with abrupt chord changes that call attention back from the groove to the wistfully optimistic lyrical theme. Both songs give us reason to suspect there’s much more to In Our Heads than any one particular single — and that it’s less about the head, more about the heart and hips.